With the release of Dell Alienware’s M18x laptop, many gamers and enthusiasts have been impressed by the performance seen with its dual NVIDIA GTX 580M SLI graphics cards. Owners of the M18x predecessor, the M17x-R2, upgraded their laptops from the 285M SLi configuration to that of the 580M SLI platform, thinking it would be an easy upgrade to make their laptop of equal value in comparison to the M18x. Unfortunately, while the 580M cards were installed correctly, SLI was not enabled in the driver as the graphics upgrade was not natively supported by Alienware or Dell, effectively only allowing the use of one GPU. Now, that’s no longer the case. Anatolymik, author of HyperSLI, has developed a modified driver allowing M17x-R2 users to enable SLI on their laptop for the full graphics performance and experience. HyperSLI enables SLI with a click of the mouse on motherboards and chipsets normally considered to be “non-SLI” compatible. With the advent of HyperSLI and its wide range of success on a variety of systems, HyperSLI was adapted with the addition of a modified driver based off NVIDIA’s latest ForceWare version 290.53. 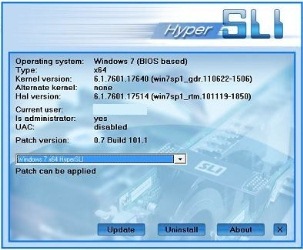 By installing HyperSLI and the modified driver, users can have the same SLI capabilities that M18X owners currently have. How does it work? – It’s pretty easy. First, download the HyperSLI patch from here and run it. You will need to disable UAC and be running as Administrator in order to install the patch. (For more information on HyperSLI for other systems, take a look here). Once you have installed the patch, you will need to reboot your computer. You will now notice that there is a startup entry enabled by default called HyperSLI. Once you have booted into this startup entry (which is configured by default), you will notice a new icon in your system tray showing that HyperSLI is successfully running on your machine. In most cases, this would enable SLI on the machine in question, but for the M17x-R2, users have to go one step further. Next users will need to head over to NVIDIA’s website and download the latest driver ForceWare, version 290.53, from their website. Once downloaded, extract the NVIDIA package by clicking to run. When the installer opens up, cancel the installation process. Now the driver modification needs to be inserted in order for SLI to properly be enabled in the NVIDIA Control Panel. In order to do this, you will need to copy three modified files into the “Display.Driver” folder in the extracted driver folder. You can download the modified files needed here. Extract the modified driver zip and copy the files into the folder as mentioned earlier. Then run the NDIVIA driver setup. Make sure to select all in the installation process, including the 3D Drivers and its corresponding software components. 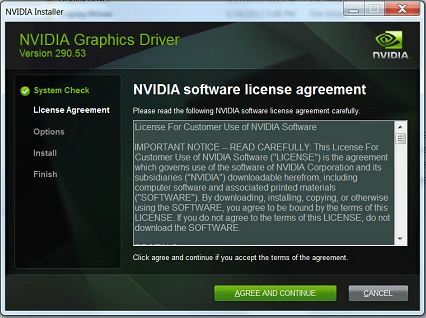 Failure to do so will result in SLI not being enabled. Once finished your computer will be restarted. That’s it! 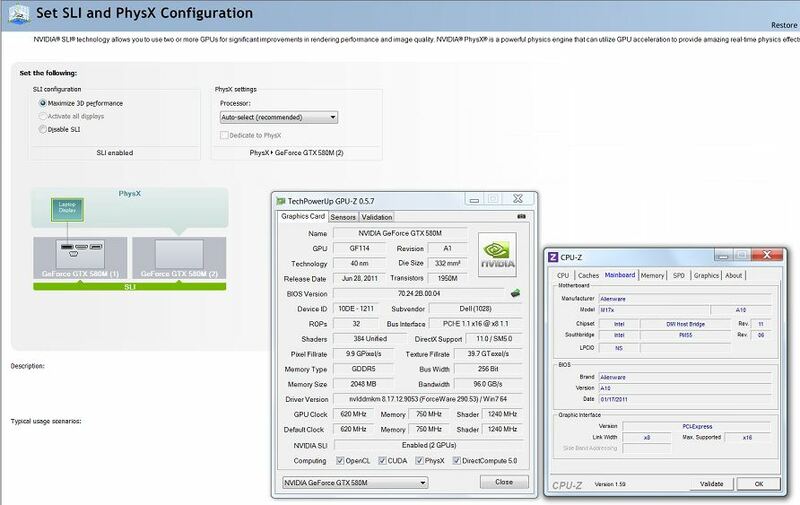 You can now view your NVIDIA Control panel and enable SLI with 3D performance. If you have properly installed the patch, you will see something similar to the screenshot below. 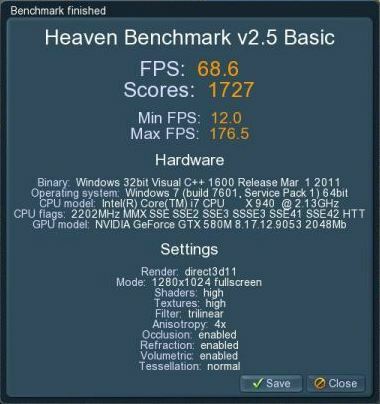 We measured the performance of SLI on the M17x-R2 using the latest Unigen Heaven benchmark for Direct X 11, and compared it to having SLI disabled. The results speak for themselves. 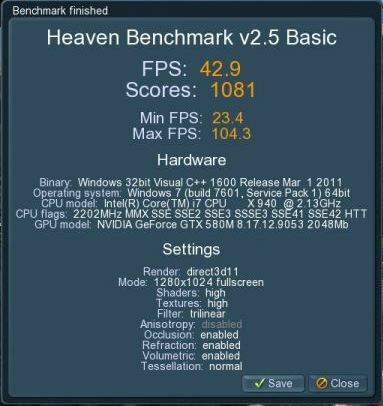 Hi, i am from Romania and i try to make SLI with nVidia GTX 580 m on Alienware M17x R2, it’s an upgrade from GTX 285m. I allready connect the GPU’s, with the same vbios version, i allready install the video driver 331.82 with the nvdmn.inf modified, i can see the 2 x GTX 580 in device manager installed corectly but i don’t have the nVidia SLI option, in the nvidia control panel. I tryed to make all the steps that you have mentionated in the topic with the hyperSLI and the 290.53 modified driver but it does not work beacuse the graphics driver could not find compatible graphics hardware. Please a wait an answer, thanks!!! Make sure you fully clean and remove your old drivers. Use drivesweeper or similar versions to get rid of the old drivers and then install the modified drivers.